A. Lateral view. Reciprocal LIN-12 signaling between VU cells Z1ppp (AC/VU) and Z4aaa (AC/VU) establishes one as the anchor cell (AC) and the other as a ventral uterine (VU) precursor cell. (DU) Dorsal uterine precursor; (SPh) somatic gonadal primordium of the hermaphrodite. Precursors are colored according to the tissues to which they give rise in the adult. B. Lateral view. 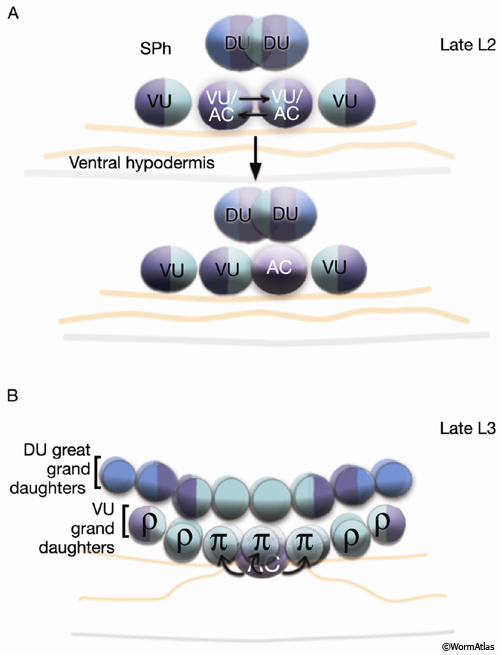 LIN-12 signal from the AC induces the six nearest VU grand progeny to adopt the π fate. Remaining VU grand progeny adopt the ρ fate.